Black Panther review: "A serious claw-hold on scale and spectacle"
Confident, assured and athletic filmmaking. And with Boseman on such dignified, dynamic form, his Infinity War return can’t come soon enough. “It’s hard for a good man to be a king.” Spoken in a mystical dream, these words resonate across Ryan Coogler’s splendid Black Panther, the MCU’s 18th movie – and its first one centred on a superhero of African origin. What it means to be a leader is a crucial theme in this stand-alone adventure for T’Challa (Chadwick Boseman), the sovereign-in-waiting of the fictional (and highly advanced) nation of Wakanda. We already know Black Panther will be back in the imminent Avengers: Infinity War, but here we dig into the origin stories of both the character and his country. 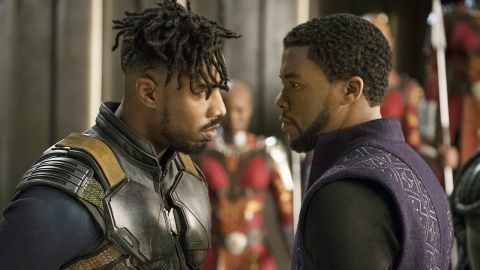 Coogler (Fruitvale, Creed) and his co-writer Joe Robert Cole set the story, naturally, after the events of Captain America: Civil War, where T’Challa’s father, T’Chaka (John Kani) was killed in a bombing orchestrated by Helmut Zemo. The first third of the movie takes its time, with T’Challa forced to battle, literally, for his father’s throne – in a beautifully shot fight sequence on the edge of a waterfall – and become the so-called Black Panther. With the athleticism of Black Widow and a suit cooler than Iron Man’s, he’s an admirable fighter. But he’ll need more than combat skills in a globe-trotting plot that begins in London, where Age of Ultron mercenary Ulysses Klaue (Andy Serkis, having a ball) steals a Vibranium artefact. It’s this theft that leads T’Challa to Busan to intercept Klaue, as the latter meets with CIA official Everett K Ross (Martin Freeman) to trade his bounty. Cue a stand-out sequence – the South Korean city looks so vibrant on film – that whizzes from a casino-set smackdown to a stunning through-the-streets chase. And Coogler brings the funny, too: one sight gag, involving a car seat and steering wheel, would do silent-comedy king Harold Lloyd proud. As well as breaking ground with its African focus, Black Panther also avoids being another superhero sausage-fest. Nakia (Lupita Nyong’o) and Okoye (Danai Gurira), the head of the Dora Milaje – T’Challa’s all-female kickass bodyguard team – are notably defined. But the most fun is had by T’Challa’s 16-year-old sister, Shuri (Letitia Wright) a gadget-master who’s Q to Black Panther’s 007 (Tony Stark should employ her immediately). Then there’s Erik ‘Killmonger’ Stevens (Michael B. Jordan), a renegade Black Ops soldier of Wakandan descent who has vengeance and violence on his agenda. He’s but one of a lip-smacking pool of talent that includes Angela Bassett, Forest Whittaker and Get Out Oscar nominee Daniel Kaluuya. The extensive ensemble is very much led from the front by Boseman, an intellectually and physically agile performer who simply rocks as Black Panther. Running 134 minutes, it flags in places; the finale in particular could use some trimming. But throughout, Coogler keeps an ambitious number of balls in the air. Whether the movie will prove a watershed moment for diversity in Hollywood blockbusters remains to be seen. There’s little doubt, though, that the director has a serious claw-hold on scale and spectacle.